Quakers are particularly good at raising up voices from the past – from the lives and ministry of people who have lived in faith and who are (we believe) now with the Lord. We publish their journals. We have schools and scholarships in their names. We maintain historic properties and meetinghouses. We manage and distribute income from endowments. We have vast archives of family records, monthly meeting minutes, and genealogies. Sometimes it’s more than just a little intimidating to be the custodians and caregivers of all this history. Many Friends meetings are afflicted with what I call “brass plaque syndrome” – we want to memorialize every person and every gift, so that even when the people who gave the gifts are long gone and no one in the meeting has any personal memories, the brass plaques will still be there as a reminder. Springfield Friends Meeting, where I serve as pastor, has 42 brass plaques in the worship room alone. There are also two historic grandfather clocks, one of which was built by a Quaker cabinetmaker in 1797, traveled to Indiana and on to Washington during the great Quaker migrations, and was brought back here in the 1930’s. There are also two large, ornate and no doubt historically significant earthenware jars, an organ, a piano, a pulpit, pew card holders and a dozen replacement energy-efficient windows with names on them, plus two large cast-bronze plaques on the outside of our “new” 1927 meetinghouse, on the covered walkway leading to our “old” 1858 meetinghouse, which now holds a delightful Museum of Old Domestic Life, filled with things in daily use in Quaker homes from the 1800’s. Other legacy items are less historic but full of emotion. Last week one of our older members said, “I want you to have my son’s guitar. He died of cancer when he was 16. I want you to play it.” When someone offers you a gift like that, you can’t say no. On a shelf in my office is a small stuffed toy bear, which I keep as a personal reminder of a member of West Richmond Friends who lost her husband of almost 70 years and clung to the bear for months, crying and helplessly calling his name. Marie’s bear is going to be with me for a while. It’s a great privilege to care for so many pieces of faithful lives. I’ve re-edited one of the great Quaker journals, The Autobiography of Allen Jay, a minister who Rufus Jones called “the best loved Quaker in America,” and given dozens of talks and workshops. I discovered for myself and shared the first-hand stories of Quaker suffering during the Civil War which Stanley Pumphrey, an English Friend, recorded from the simple North Carolina Friends who lived through it. More than most other religious groups, Quakers constantly refer to our past – the “historic testimonies” of simplicity, peace, integrity, community and equality are regularly featured in Quaker circles. Pound for pound, we quote our founding leaders more than anyone else I know. There are times when Quakers feel that our past is more of a burden than we want to bear. I have visited many Quaker meetings which keep on using historic benches which are really uncomfortable, or furniture which is worn and ugly. I have visited dozens of meeting libraries which are filled with books which haven’t been taken off the shelves since the Eisenhower administration, but which no one has the nerve to throw away. One issue to which I am particularly sensitive is how our obsession with the past comes across to newcomers. Some people (especially those with Quaker ancestors) are excited by our history, while other people are turned off or simply puzzled by Quaker jargon and Quaker genealogies, which they experience as a serious barrier to being included. I’m a great believer in the value of mission work and have given many hundreds of hours to supporting it. I’ve also heard Quaker leaders complain about what they call “legacy missions” which they feel are draining energy and money and which keep us from stepping out in new directions. What do we do about this? There will always (or at least for a while) be Quakers who want to preserve, protect and enshrine our past. 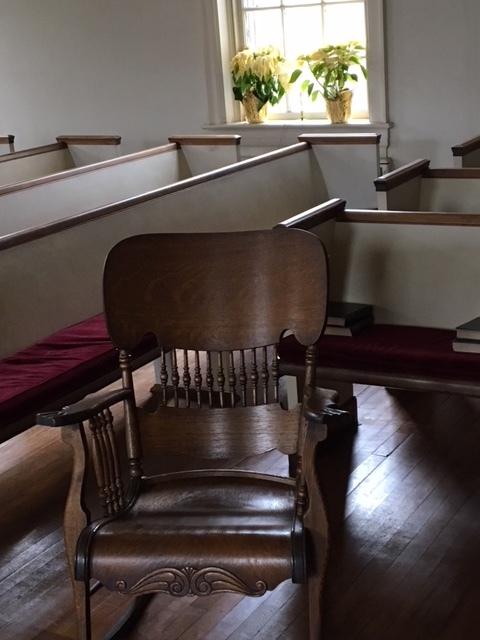 There will also be Quakers who are more-or-less oblivious to the precious but moth-eaten chair that a certain beloved minister sat in for 40 years, who are much more concerned with new ministries should take precedence over Quaker antiquities. How have you wrestled with this problem in your own life, in the life of your meeting, and in the life of Quaker organizations? When does learning from the past cross over the line and become deifying it? How do you physically handle all that historic stuff? I look forward to some lively responses.